MUMBAI, India, CMC – Kieron Pollard equalled the fastest half-century of the Indian Premier League this season and became only the sixth player in history to eclipse 6 000 Twenty20 runs, as he propelled Mumbai Indians to an emphatic six-wicket victory over Kolkata Knight Riders here yesterday. 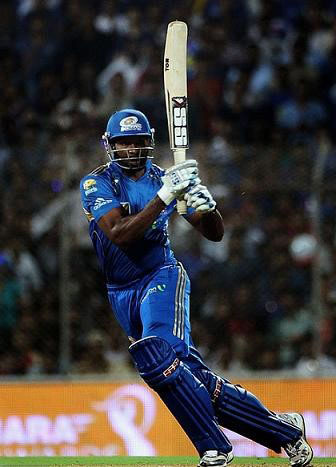 Set 175 for victory at the Wankhede Stadium, the hosts romped to their target with two overs remaining, with Pollard blasting an unbeaten 51 from a mere 17 deliveries. He arrived at the crease at the end of the 13th over with the reigning champions Mumbai still requiring 69 for victory, and dominated the remainder of the innings striking two fours and six sixes. Captain Rohit Sharma struck an unbeaten 68 off 49 deliveries while Ambati Rayudu chipped in with 32. Pollard’s West Indies teammate and fellow Trinidadian, off-spinner Sunil Narine, produced a brilliant spell of two for 22 from his four overs but was unable to halt Mumbai’s charge. West Indies all-rounder, Andre Russell, went wicket-less from his three overs of seam which leaked 28 runs. Earlier, Gautam Gambhir top-scored with 59 off 45 balls in a 69-run, first-wicket stand with Robin Uthappa, who made 36 from 20 balls, after KKR were asked to bat. Batting at number five, Russell stroked 22 off 16 balls with three fours before he was bowled by Kiwi paceman Tim Southee in the 18th over. In reply, opener Parthiv Patel (1) fell to the seventh delivery of the innings with the score on eight for one but Rohit and Rayudu added 59 for the second wicket to launch the recovery. But three wickets fell for 39 runs in the space of 37 balls to derail the run chase and much rested on Pollard’s shoulders when he arrived at the crease. He announced his intention with two boundaries off left-arm spinner Shakib al Hasan in the 15th over and followed up in the next over by blasting three sixes off medium pacer Rajagopal Sathish in an over which cost 23. 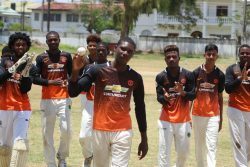 Both he and Rohit were kept quiet by Narine who returned for his final over in the 17th but Pollard finished the game in style in the next over from left-arm seamer Jaydev Unadkat. 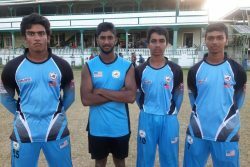 He clobbered the third delivery over mid-wicket for six, cleared the ropes at long on with the following delivery before finishing the game by smashing the final delivery – a full toss – over long off for this third six. Pollard, who now has 6009 runs, is the second West Indies player in the 6000-run club along with Chris Gayle who leads the career T20 aggregates with 8840 runs. With the victory, Mumbai moved into third spot on eight points, behind KKR only on net run rate, with Gujarat Lions two points clear at the top.